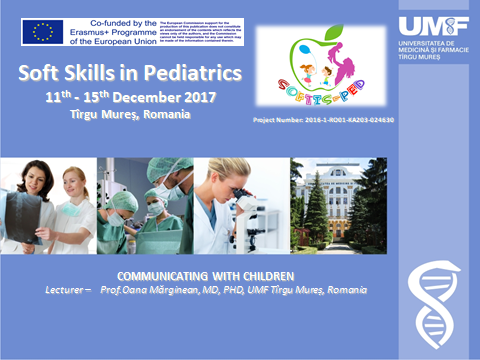 The course entitled Softskills in Pediatrics was held at the University of Medicine and Pharmacy of Tirgu Mures, during 11-15th of December 2017, as part of the Erasmus+ Strategic Partnership SoftisPed – Softskills for Children’s Health. The lecturers were Oana Marginean, Simona Muresan, Mihaela Chincesan, Lorena Melit, Anisoara Pop, Anca Gherasim, Andreea Varga. There were 6 international participants and 21 participants from Romania.